"This is an easy recipe that is pretty much fool proof. I manage a market cafe that serves homemade pastries in the morning, and this 'made-up' recipe was a total seller with our customers. Now they come in and ask for these over and over. I hope you'll enjoy these as much as our customers do." Arrange almonds in a single layer on a medium baking sheet, and bake in the preheated oven 5 to 10 minutes, until lightly toasted. Reduce oven temperature to 350 degrees F (175 degrees C). Lightly grease a 6 cup jumbo muffin pan. In a medium bowl, mix flour, sugar, 3/4 cup almonds, baking powder, baking soda, and salt. In a separate medium bowl, mix water, almond extract, butter, and eggs. Blend into the flour mixture. 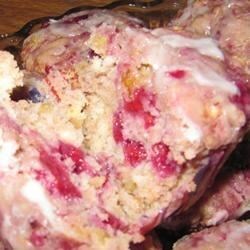 Fold raspberries into batter. Spoon into the prepared muffin pan. Sprinkle with remaining almonds. Bake 25 minutes in the 350 degrees F (175 degrees C) oven, until a knife inserted in the center of a muffin comes out clean. Not bad but they were pretty tart and an odd grayish color.